The Biblical World: Jesus Have I Loved, But Paul? 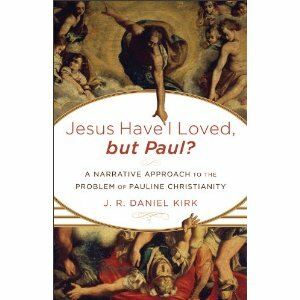 As I mentioned last week, Baker Academic is hosting a blog tour for J.R. Daniel Kirk's Jesus Have I Loved, but Paul? (Baker Academic, 2012). I am grateful to Baker Academic for providing me with an advance copy. Over the course of the next two weeks (January 9th to January 20th) different bloggers will be reviewing and interacting with the content of Kirk's book. I will be reviewing chapter 7 Liberty and Justice for All? on January 17th. Kicking us off today is an Introduction from J.R. Daniel Kirk himself and Nijay Gupta will be reviewing chapter one. Also, be sure to stop by the blog tour hub and don't forget to enter a chance to win five books from Baker Academic.